As your loved one ages, it becomes difficult to be there for them emotionally and physically 24/7. This is when a companionship becomes of great importance. 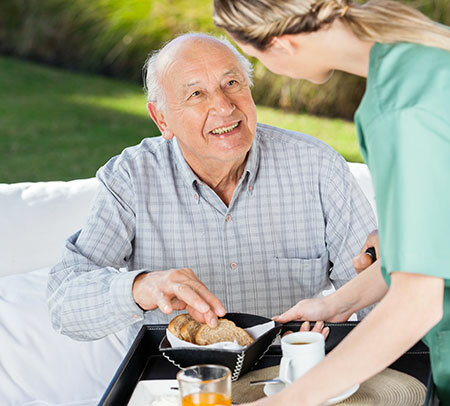 Companionship provides clients with someone to interact with on a frequent basis, making everyday life a lot easier. These regular interactions are also very important to boost brain stimulation, which is critical to the client’s overall well being. A companion ensures that clients are enjoying life in the comfort of their home, as well as accompanying them to activities and events in their community. It is proven that companionship promotes longevity. Diet: Having a companion to share meals with can encourage an elderly individual to eat healthy. Health: Social interactions impact our mental state. It can create feeling of contentment, which affects the clients’ physical body in a positive way. Exercise: Having a companion will encourage clients to create healthy habits, go for walks or exercise around the house if equipment is available. Sleep: Hope is everything for an elderly. Knowing that the next day they will have someone to talk to, hang out with creates a peaceful sleep and longer cycles of sleep. Daily Socialization: As elderly individuals stay in their home, it can be very lonely, which is not healthy for their mental state. Companion care provides company for seniors. It helps the client engage in conversation and verbalize their feelings, concerns and thoughts. Reduced Feelings of Depression: Limited interactions with people can affect an elderly’s mental state and causes a rapid decline. Companionship is very important; it creates a happy and enjoyable environment for seniors.